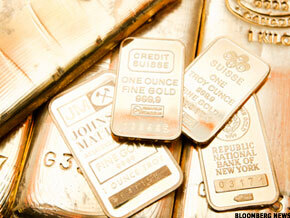 Manipulation is offering investors a wide window for increasing their gold holdings at suppressed prices. NEW YORK ( ChrisMartenson.com) -- The price of gold is being actively managed by central planners and their proxies. The main culprit here appears to be the U.S. authorities, as the manipulation is most apparent in the U.S. open gold market. For the most part, this "management" has resulted in letting the price of gold rise, but not too much, or too quickly. The price of gold has always been an object of interest for governments and central bankers. The reason is simple enough to understand: Gold is an objective measure of the degree to which fiat money is being managed well or managed poorly. As such, whenever paper money is being governed poorly, the price of gold becomes an important barometer. And this is why the actual price of gold is a strong candidate to be "managed." Or "influenced." Or "manipulated." Whichever word you prefer, they all convey the same intent. Some who are reading this are likely having an eye-rolling moment because they hold a belief that there is no conspiracy to manage the price of gold. This is an interesting belief to hold because it runs heavily against the odds. It's similar to holding the belief that the house in Vegas does not have a statistical advantage. We could spend a lot of time discussing how a belief such as "gold is not being manipulated" gets promoted and inserted into the popular consciousness, but we won't. Instead, we'll simply note that the people who hold this belief -- and you may be among them -- react to the concept at a visceral level, often with strong emotions such as anger or contempt, and even anxiety. When a strong emotional response surfaces during a conversation of ideas, it usually means that beliefs are in play -- not facts nor logic. Experience has taught me that when someone becomes dismissive or angry or hostile when the idea of price manipulation is discussed, it's best to simply drop the conversation and move on. No combination of logic or facts is effective against a deeply held belief. It's better to wait until some new evidence calls that belief into question, opening the door for revisiting the topic. But for those with an open mind, there is a very interesting trail of dots to connect. Unlike beliefs, opinions can be discussed and even modified without first running through an emotional thicket. They rest on data and ideas that can be consciously accessed and are therefore easier to change. It is my opinion that the price of gold is being actively managed and/or overseen by official parties. On a strictly qualitative level, I hold this opinion because if I ever found myself in charge of a system of money rooted in confidences, as is our current fiat regime, I would consider the active management of the price of gold one of my fiduciary responsibilities. Gold is an important signaling mechanism, and our entire money system is faith-based. Of course anything and everything that could cast doubt on that system would be controlled if it could be controlled. To emphasize the point: If gold were suddenly to spike up to $5,000 an ounce, all sorts of troubling questions would emerge for people. Such as, is there something wrong with the dollar? Is the world falling apart? A rapid spike in the price of gold would certainly cause people to question the current state of the world of fiat money, and that is an unpardonable sin when your money is, at root, faith-based. Instead of asking why do you think the price of gold is controlled? I ask why do you think the price of gold is NOT controlled? Out of all of these efforts, certainly the one with the most dramatic impact is the management of the price of money. That sets the stage for nearly every ill that follows, especially including the encouragement of taking on additional risk and the inevitable malinvestments that result. In a Wall Street Journal op-ed, Bernanke openly revealed something that was already obvious to many: the Fed has been very carefully following the equity markets because of the importance of rising stock prices in fostering consumer spending. That is, the stock market is a signaling device, and the Fed is, naturally, quite interested that it signal the correct things. More bluntly, the Fed is interested in seeing the stock market go up instead of down. This approach eased financial conditions in the past and, so far, looks to be effective again. Stock prices rose and long-term interest rates fell when investors began to anticipate the most recent action. Easier financial conditions will promote economic growth. For example, lower mortgage rates will make housing more affordable and allow more homeowners to refinance. Lower corporate bond rates will encourage investment. And higher stock prices will boost consumer wealth and help increase confidence, which can also spur spending. Increased spending will lead to higher incomes and profits that, in a virtuous circle, will further support economic expansion. Yes, Virginia, the Fed does watch stock prices closely. And it targets their efforts to assure the "virtuous circle" is in play. No real surprise there. Given that big list of managed prices and signals, with literally nothing left untouched because of the price-of-money effect, we are again left to wonder how likely it is that anything has escaped the attention and efforts of our well-meaning (but certainly misguided) central planners. To my view, gold is simply far too important to be left to its own devices. The evidence strongly suggest that it indeed has not been. Critics of the idea of price manipulation might scoff and ask, if gold is manipulated as you say, then how do you account for the 590% price increase over the past 11 years? The idea here is that if gold were manipulated or controlled, there's no way it would have "been allowed" to increase by that much. In the above chart, we can see that gold has been in a remarkably steady run for the past three years. It is almost as if a ruler has been drawn under the price of gold, which has rarely deviated by much from that trajectory. Certainly some might argue that this is an extremely poor piece of data in support of the idea that the price of gold has been manipulated, unless we want to argue that it has been manipulated upwards to rise nice and steadily (like being slowly pumped into a balloon). A fair point, perhaps, yet it is one that not only completely falls apart, but bolsters the case for price suppression when we examine the price action of gold in the daily vs. the overnight markets. Note in this next chart that if one simply bought gold and held it only during the open and close of the U.S. daily fix, one would have lost 70% of one's money during the same period of time that gold rose in price by more than 500%. As the chart above shows, the performance is dismal. For example, a hypothetical gold investment fund starting with $100 million in 2001, and using it to buy gold at the US AM fix and sell it at the US PM fix would now be left with just $31 million, almost a 70% loss in just under ten years. Over the same time period, gold prices have risen over 590%. Here we might ask a simple question: How is it possible that an asset that rose across all world markets by more than 500% fell during active trading in the most important market of them all (by volume) by 70%? Trading is a zero-sum game, and for every winner there is a loser. Who was it that lost so much money in the daily markets fighting a tide that lifted the golden boat by more than 500%? How can there be such an uninterrupted series of losses for gold during this period? There's a trading maxim that goes: once a trend is established, other traders will identify that trend and either ride it or step out of the way. That is, sooner or later the trend stops, because too many people have caught onto it and its profitability gets traded down to zero. Yet selling gold into the daily market has been a sure-fire winner for over an entire decade. For gold to have fallen so much during the daily market, yet be up overall, simply means that gold must be up strongly in the overnight markets. Indeed, this is the case. This strategy captures both the daily losses and nightly gains into a single, combined monster gain that has returned over 5,000% over the past decade with very few drawdowns, handily beating the price of gold itself by a factor of ten. Again, how is it possible for a single strategy to be such a reliable winner without being competed away to zero? A very simple explanation is that an entity that does not care about potential losses simply and reliably sells gold into the daily markets. After a while, the self-reinforcing aspect of this behavior might entice other market participants to join along and sell into the daily markets. However, even if that were the case, in order to be neutral (as all trading eventually has to be) these positions would eventually have to be bought back. And given the fact that gold has risen by more than 500% over this timeframe, there would be no safe time to do this outside of the daily session. So the question persists: Who has been selling into this market, and how large are their positions? Put more bluntly, how much gold is actually left in Fort Knox? Alternatively, just what is exactly is contained within the $180 billion "other assets" line on the Fed balance sheet? Deeply underwater gold futures positions, perhaps? One other daunting challenge to the idea that gold is not being manipulated is that such a thought requires us to presume that all the past known and proven efforts at gold manipulation are just that: in the past. One thing I know is that when a tool has proven to be effective -- whether it is secretive liquidity injections by the Fed, or MBS purchases -- that tool tends to get used again and again, and in increasing amounts if called for. That is, what works is never dropped; it is merely set aside when not needed. Or, if we believe that gold indeed has an important signaling function, it becomes all the more difficult to argue that its price is simply left to "the market" to set. On June 3, 1975, Fed Chairman Arthur Burns, sent a "Memorandum For The President" to Gerald Ford, which among others CC:ed Secretary of State Henry Kissinger and future Fed Chairman Alan Greenspan, discussing gold, and specifically its fair value, a topic whose prominence, despite former president Nixon's actions, had only managed to grow in the four short years since the abandonment of the gold standard in 1971. In a nutshell Burns' entire argument revolves around the equivalency of gold and money, and furthermore points out that if the Fed does not control this core relationship, it would " easily frustrate our efforts to control world liquidity" but also " dangerously prejudge the shape of the future monetary system." Furthermore, the memo goes on to highlight the extensive level of gold price manipulation by central banks even after the gold standard has been formally abolished. The problem with accounting for gold at fair market value: the risk of massive liquidity creation, which in those long-gone days of 1975 "could result in the addition of up to $150 billion to the nominal value of countries' reserves." One only wonders what would happen today if gold was allowed to attain its fair price status. And the threat, according to Burns: "liquidity creation of such extraordinary magnitude would seriously endanger, perhaps even frustrate , our efforts and those of other prudent nations to get inflation under reasonable control." Aside from the gratuitous observation that even 34 years ago it was painfully obvious how "massive" liquidity could and would result in runaway inflation and the Fed actually cared about this potential danger, what highlights the hypocrisy of the Fed is that when it comes to drowning the world in excess pieces of paper, only the United States should have the right to do so. If the price of gold was not "controlled," monetary policy outcomes would have been somewhat removed from the direct control of monetary bureaucrats. Gold was a threat to an institution dedicated to increasing its effectiveness and power. To give up the battle to control the price of gold, we have to presume something that has never happened in history: the willing abandonment of bureaucratic power to an outside force. There is also the London Gold Pool of 1969 and the strong dollar policy of the 1980s, which reveal that in the past, the price of gold has been officially monitored and controlled in order to help direct either a desired interest rate or dollar strength outcome. The point here is that gold price suppression is a clear matter of history at this point and has been well studied. Somehow I think some people have forgotten that history and, quite oddly, consider it less likely that gold suppression is happening today than in the past. I say oddly because the number of overt market interventions has been increasingly enormously over the past few years, and one might think this would soften opposition to the idea that gold, too, is being actively targeted. So, if the price of gold is subject to manipulation -- or influence or control, if you prefer those terms instead -- in a way that reliably holds the price in check, then why should we buy it? In a few important ways, it's because of the very fact that gold remains the subject of so much official concern and secrecy. The laws of supply and demand tell us that anything with a cheaper-than-market price will experience stronger-than-usual demand. In the case of gold, we might suspect that purchases of gold have been bolstered by a weaker-than-otherwise price. Among those benefiting from buying cheaper-than-otherwise gold would be anyone and everyone who has bought gold lately. Private and official purchasers alike have been getting a very good price, indeed. Where you and I can be thankful for less expensive gold as we add to our holdings, so, too, can India and China be pleased at the national level. If a future gold standard is in the works, then whomever has the gold at that point in time wins. To any given nation, official gold stocks held by the central banks represent just one stock of gold, with that held by private parties representing another. India has always had a robust domestic gold market and is among the strongest of the strong hands. Gold goes into India and just never seems to come back out. China legalized and then modernized the gold market for its citizens, and gold sales there have been increasingly robust over time. Germany recently faced a "call from within" to repatriate the gold that is currently held in its name in reserve by the New York Fed, perhaps channeling the concern that said gold would be safer within its own borders than in the U.S. Given the confidence-shaking rehypothecation fraud perpetrated by MF Global, a bit of caution on the part of foreign concerns regarding the US's trustworthiness is warranted. All told, we are seeing a very interesting game play out around gold, and my suspicion is that it is the possibility of eventual re-monetization that motivates some of the moves. If this comes to pass, the gold price suppression will prove to be a most unfortunate mistake, providing short-term political and market cover for excessive money printing while sacrificing long-term advantage to those taking the other side of the suppression trade. In Part II: How High & When To Sell?, we explore the most likely price targets for gold under the scenarios we believe are most likely to play out over the coming years. Equally as important as understanding where the price will go is knowing when the time has arrived to exchange your appreciated gold for other assets. We investigate both, as well as which asset classes to start tracking now in expectation of rotating into them with your gold proceeds when appropriate. Chris Martenson is an economic researcher and futurist specializing in energy and resource depletion. He is the founder and editor of the Web site ChrisMartenson.com, as well as its popular video seminar, The Crash Course. Martenson is in the 'dot-connecting' business. A former scientist and Fortune 300 executive, he studies macro trends through his proprietary analytical framework based on the interdependence of the 'Three E's' -- the economy, energy and the environment -- and uses this lens to assess the probable impact of current developments in the marketplace. This is used to help readers and clients mitigate and contain risk.